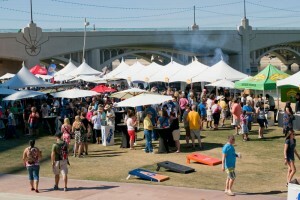 Taste in Tempe is always a popular event. One of the first events of Phoenix’s Food Festival Season, the crowds flock to this event. The 3rd annual Taste in Tempe gave attendees the opportunity to explore a diverse culinary scene with more than 30 independent restaurants and exclusive craft breweries in one scenic setting, Neil G. Giuliano Park at Hayden Ferry Lakeside, which was new to this year’s event. Among this year’s participants were: Pig & Pickle, The Little Thaiger, Spinato’s Pizzeria, The Mission @ Minder Binder, Fired Pie, Pedal Haus, Sushi 101, Snooze an A.M. Eatery, 24 Carrots, RA Sushi, DP Dough, and BP Street Cafe. In addition to great food and drinks, Taste in Tempe had some great demos and music! Presenters included: Jenn Bare the Crock Pot Girl, Chef Gregory Wiener of Top of the Rock, and Chef Olashawn Weaver of The Wild Thaiger. While all of the food and beverages we tried were great, there were two restaurants that really stood out to us: BP Street Cafe and The Wild Thaiger. BP Street Cafe served Sambal Fried Rice (fried rice with sambal), Mee Siam (Malaysian stir fried rice noodles with a mild dried curry sauce with tofu, shrimp, chicken, egg, and bean sprouts), Char Kway Teow (Malaysian stir fried flat noodles), chicken and Bandung (a mix of coconut milk, milk and red bean). We were excited to try Malaysian food because while Thai food is prevalent in Phoenix, other areas of Southeast Asia are not. We really enjoyed the variety they offered and will definitely be trying more of their food! The Wild Thaiger served 24K (eggplant, thai pumpkin, string beans in spicy green curry). We have had The Wild Thaiger at other events and their curries are always consistently amazing! If you haven’t tried their Panang Curry, you’re missing out! Taste In Tempe was definitely a fun filled event! What we loved, was that while it is a traditional food event in that you have good food and entertainment; it still surprises you with some exotic flair like the great food from BP Street Cafe and The Wild Thaiger! 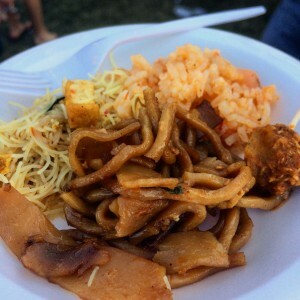 What are some of your favorite food events? We’d love to hear your thoughts in the comments below!